A lot of people consider packing for their trips a hassle - it's a lot easier when you have much of it done in advance. When we go on our trips about the state, some of our items already are packed, while others have an itinerary. Of course, we try to pack light. It’s easier and it provides plenty of space should we find something we simply cannot live without. Over the course of time, we have developed a number of pretty-much pre-packed cases that are ready to go out the door. 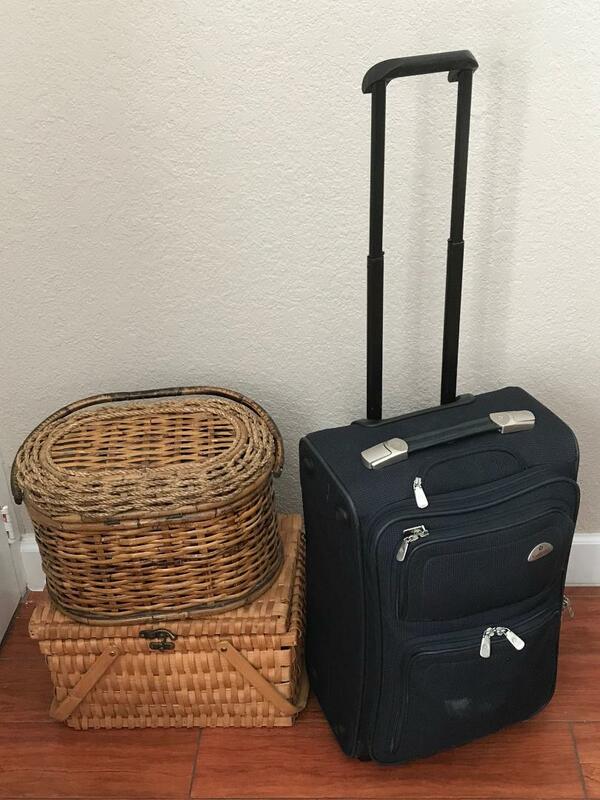 We have two baskets and a cooler that generally can be taken to the car at a moment’s notice, leaving only our suitcase to be packed for our current excursion. Our Travel Case stays ready. It is a basket containing a night light with extra bulb, essential oil and diffuser, door stop alarm, projection clock, small blow dryer, multi electric plug with USB bugs and note book and pen among other things. The other is a picnic basket. We carry that for our grocery needs. For instance, we don’t do Styrofoam – so there are paper cups. There also are some paper plates, paper bowls, a small pack of plastic dinner ware and napkins. Rather than relying on motel fare, we carry our favorite teas, coffee bags, MCT oil powder and small bottles of honey. We always have small bottles of apple cider vinegar,small bottles of naturally sweetened ginger ail’ small bottles of extra virgin oil. Himalayan sea salt, and small plastic bags of organic waffle mix. Because of the shelf life, we can re-stock these at the end of each trip and have them ready to go for the next time.. Just before we leave, we throw in a couple of fresh bottles of purified water. We use bottled water in the coffee maker in the room inasmuch as it makes the coffee taste so much better than if we rely on the motel’s tap water. In our suitcase, each of us has a clear plastic toiletries bag that has soap, deodorant. razor, small shampoos and hair care products. which stay pretty much intact and in the suitcase. Some of the items, such as small bottles of shampoo or small soaps actually are souvenirs of previous motel stays. When it comes to packing the suitcase, less is better. We carry fresh underwear, some lounging clothes. a couple pair of casual pants. one pair of dress paints (maybe a skirt for the Mrs.) and several choices of tops. However, we don’t pack a lot of clothes because we are traveling to different locations and can get a couple wears of our outfits. Additionally, there are “souvenir clothes” we pick up in our travels, and having space in the suitcase allows us to bring them back without traveling with shopping bags full of miscellaneous items. Because we live in Florida we have beach shoes and beachweare packed in the car at all times. Bags for shelling is also found helpful. For our trip we generally only carry one extra pair of shoes. couple bags already packed and having your list of necessities can take a lot of the hassle out and keep you from forgetting important things at the last minute.